What does it take to sell high-end luxury creations to the richest clients in the world? In Selling Luxury, Robin Lent and Genevieve Tour, with 30 years of combined experience, share their savoir-faire. You'll also pick up tips from multi-million dollar luxury sales professionals who will help you understand the complexities of the universe of luxury. Selling Luxury will show you how a salesperson can acquire Sales Ambassador status by offering the impeccable service associated with the world's most prestigious brands. ©2009 Robin Lent and Geneviève Tour (P)2012 Audible, Inc. Decent theory for beginners...not much else. This plays out like an etiquette book from the 50s. There's not much beyond obvious good sense and service. 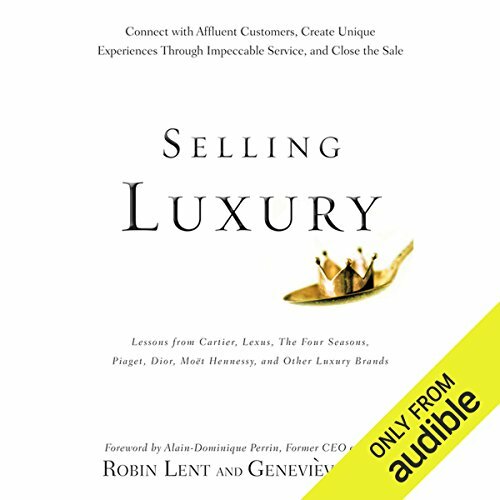 I'm halfway through another book on the same topic, and it delves much deeper into affluent mindsets, expectations, where to find such people and how to appeal to their high expectations/push past their distrust of salespeople. Would you try another book from Robin Lent and Genevieve Tour and/or Jo Anna Perrin? Has Selling Luxury turned you off from other books in this genre? There are plenty of good books in this genre but this isn't one of them. Would you be willing to try another one of Jo Anna Perrin’s performances? The author states "selling a Lexus is different to selling other brands of cars. Building a relationship is more complex than before.. customers want a lifestyle.."
As a listener, naturally i was intrigued to hear how Lexus do this. Poised to note down some tips & ideas - all the author then said was.. "LEXUS HAS ITS OWN APPROACH". That was it - end of chapter. I absolutely loved this book. It has transformed how I do business. Sometimes we forget the little things over time. This got me back on track.